President Trump and his aides reacted with indignation Wednesday to an unsigned opinion column from a senior official blasting the president’s “amorality” and launched a frantic hunt for the author, who claims to be part of a secret “resistance” inside the government protecting the nation from its commander in chief. 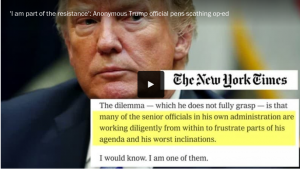 The extraordinary column, published anonymously in the New York Times, surfaced one day after the first excerpts emerged from Bob Woodward’s new book, in which Trump’s top advisers painted a devastating portrait of the president and described a “crazytown” atmosphere inside the White House. Taken together, they landed like a thunder clap, portraying Trump as a danger to the country that elected him and feeding the president’s paranoia about whom around him he can trust.